The MOORASSURE mooring line monitoring system is used to confirm the integrity and performance of catenary mooring systems by monitoring the mooring lines angles to deduce their mean tensions. On each mooring line, an INTEGRIpod inclinometer is attached to measure its mean angle. Using acoustic data linkers, the measured angle is periodically transmitted to vessel mounted acoustic receivers. The measured mooring line angles are collected by a topside data acquisition system. allow its retrieval and installation by ROV or diver. The logger holders can be attached to chain links or on the chain stopper below the chain table. 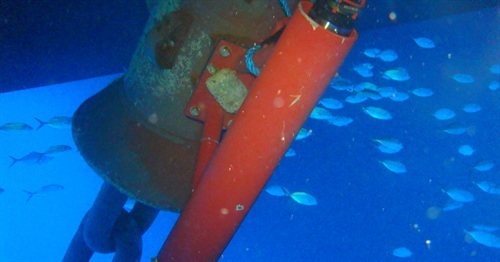 A number of hull-mounted acoustic receivers are connected using electrical cables to an industrial rackmounted data acquisition system located on the topside. The calculated mooring line tension is displayed and compared with preset thresholds. Where measurements exceed predefined threshold, alarms are raised by the software.